I haven’t gotten nearly as much done as i thought I would with a week off my feet. You see my mind hasn’t been able to focus much more than to color a bit off and on and to re-read parts of on of my new favorite books. I’ve been blessed with lots of flowers two sets you see above and lots of wonderful food. So not only have I been taken care of but my boys have also. Let me explain the pictures above — the top left corner is me holding my new favorite book. 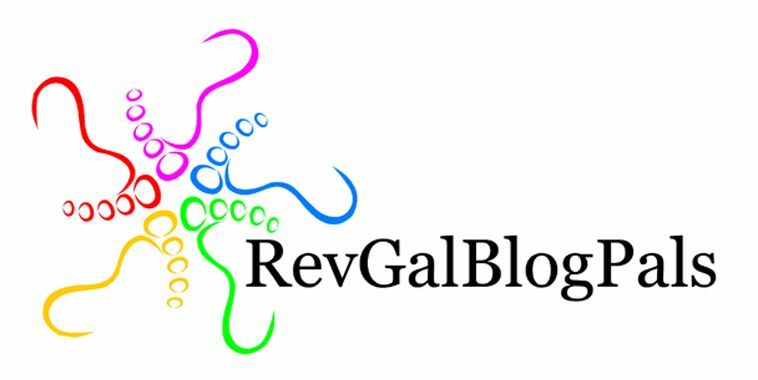 It’s a book put out by REVGALBLOGPALS and is short essays about the joys, challeneges and even the laughable moments of ministry. If you are a femaile in ministry, support a female in ministry, are a female thinking about ministry, or want to know what it’s like to be in ministry this is a candid book about life as a female minister and you need to get your hands on a copy and start reading it. The picture next to that is my big new boot that is my latest and greatest fashion accessory for the next 6 weeks or so. It’s not the greatest but life could be worse and once it’s gone so shall all the pain that came from my bunion. Then there’s the two pictures of flowers that loved ones have shared with me. Next comes coloring — one of the few things I’ve been able to focus on. I got me a new set of markers — i love these pens/markers and 10 colors weren’t quite enough so as a surgery gift I bought a set of 20. Something that even my littleman is enjoying as I attempt to write this blog post. So in between the flowers and the new markers is a stainglassed butterfly I’ve started to color. I’ll try to remember to post the finished product but please don’t hold me to that because I’m not that clear headed these days. Now give me a few days and Ill be able to take on the world. Thanks for the many ways you have cared for me and my family during this surgery. My husband told me last night he was mighty impressed with how well I was doing — so I say lets keep that up! Until next time, blessings, my friends. So I had roughly 40 minutes between meetings today and wasn’t sure what to do with my time. I knew it wasn’t enough time to get back to my office and do anything and I couldn’t grab a snack because my next meeting was a lunch meeting. I guess I could have sat in my hot car and responded to email’s on my phone but instead I remembered there was a park across from the restaurant that my next appointment was at and I could sit there and read, write and/or pray. So I headed in that direction. What a gift that decision turned out to be. I found a delightful bench in the shade with this waterfountain in front. Water is so soothing to me and I love to listen to it bubble and fall. I sat there for a bit and took the opportunity to read both the daily text and a section of a book I’m reading for counseling — focusing on being in the present and the connection between mind and body. I prayed I would continue to be present for my next appointment and then my hospital visit that would follow. I prayed for grace for myself that I would begin to accept myself in all my bodies glory and limitations. Before I knew it my 40 minutes had passed but I felt renewed and refocused. I felt alive and fresh in ways I wouldn’t have if I hadn’t accepted this gift of sabbath in the midst of the craziness of my day. I’m reminded that God gifts us with moments like this often but we often fill those moments with acts of busyness instead of allowing God’s presence to penetrate our lives. In addition to the gift of sabbath I believe I’ve found a new favorite spot to be quiet – it’s close to home and has water features and is super quiet – I susect it’s underused but will certainly become more used by me. Thank you Lord for these unexpected but much needed gifts. I enjoyed basking in your love. Springing Forward – oh I wish! Over at Revgal’s it’s time to play Friday Five again. 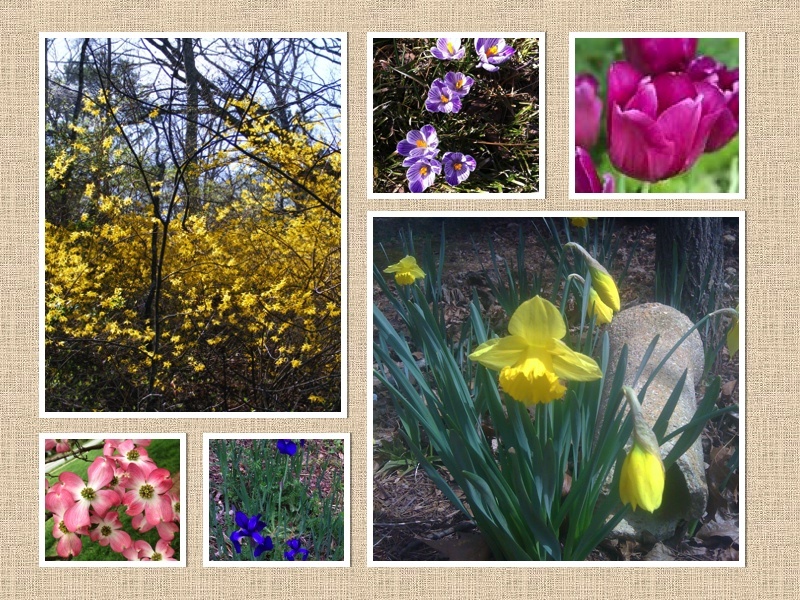 This week we are looking forward to Spring (and after such a harsh winter who isn’t?). Here in Nashville the annual Antiques and Garden Show is getting underway. The temperatures are more cold and windy than is typical, and the garden displays with colorful spring blooms are going to be tonic for many of the souls that visit the show this weekend. Punxsutawney Phil may have predicted another six weeks of winter when he saw his shadow, but spring is on the minds of many! 1) What do you anticipate with the coming of spring? 2) Is there anything you will miss about winter? 3) Is there an occasion on the horizon to which you’re looking forward? 4) Do you have a favorite spring memory? 5) Do you have a favorite spring flower/bloom, and if so, what makes it special to you? 1. Spring is a beautiful season. One that is often warm enough to be outside without a jacket during the day and cool enough to build an outdoor fire at night. Pleasant days to “play” outside and soak up some natural vitamin D.
2. One thing I love doubt winter is the opportunity to curl up with my heating blanket and take a nap or read a book. When spring arrives I usually have to put away the heating blanket for a little while. 3. A trip to Chicago at the beginning of May. I’m on the Moravian Lutheran Co-ordinating committee and this years meeting happens to be in Chicago. So I get to experience spring in a different part of the United States. Plus since it’s a bucket list place for hubby, he’s coming along and we will try to extend the trip a couple of days so we can enjoy the windy city together. 4. Favorite spring memory? Hmm that’s a bit tougher of one but perhaps the ability to jump rope, blow bubbles and ride bikes again oh and fly a kite. All things I’ve discovered having a little man in the house.